It’s been a busy busy month, i know it’s no excuse, i’ve been totally useless but i’m making a resolution to be better, more reliable and to post at least once a week. This is my aim, and by golly, i’m going to try and stick to it. Once we’d sorted everything out for our flat, you know, all the fun stuff like references and deposits etc, we decided that the only sensible thing to do was have a quick escape to the bahamas for 2 weeks. This was partly because Alex had left all of his winter clothes there and was concerned that he would freeze to death on our first cold day. The main reason of course was that England was miserable and we wanted to go back and see everyone before locking ourselves into jobs that would keep us away for a considerable amount of time. So, on the 10th of september, off we flew, we landed in the afternoon to be greeted by hayls, tarquin and a very much needed rum dum (one of my all time favourite cocktails and a nassau staple). The first few days were a haze of jet lag and trying to see everyone all at once, but after a few days, we settled back into our usual routine of having big dinners every night. It was as if we never left. I know i should have documented more and posted whilst i was away but somehow i never seemed to get around to it. One night however i did decide it was time for a bit of Indian and so embarked on a particularly yummy Madras curry (well, my take on it at least) with some garlic and coriander naan, neither of which i’d ever made before. This definitely will be repeated on here before too long so dont worry, you won’t have to wait long for it. Sadly all too soon it was time to come home. We landed on Monday morning and had to move into the new flat on tuesday morning so that first day was very hectic, shoving everything we might possibly ever need into bags and boxes, loading up the lorry and the car and off we set for London. It took me a full day to unpack the kitchen, this is probably not normal. Needless to say, it’s a very well stocked and well equipped kitchen, and the dishwasher is already very loved. However, before i went away, i did remember to photograph one of my little forays in to cooking. 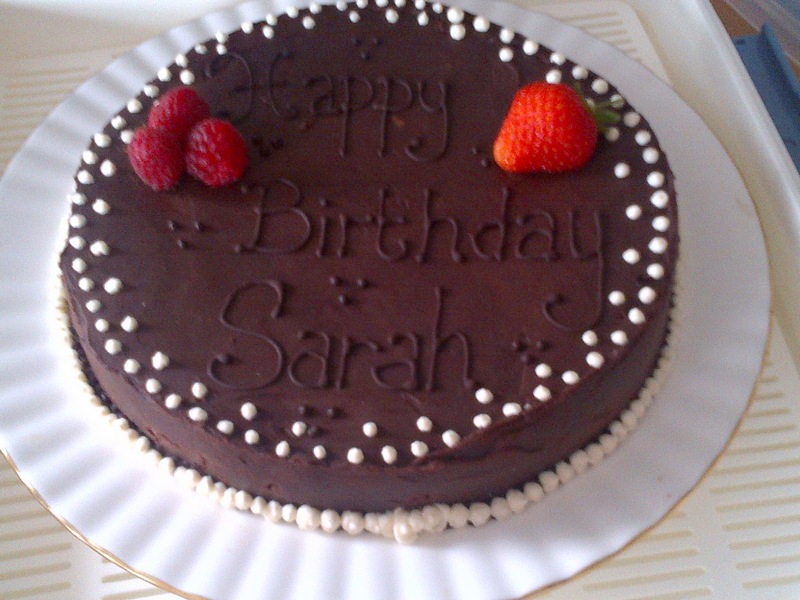 It was my friend sarah’s birthday on the 8th September and a cake was in order. Now last year year the cake was a little more elaborate, consisting of layers of caramelised pears and chocolate mousse and other delicious things. Things went a little pear shaped (sorry, had to) when we decided to pipe on the top after we’d had a bottle or two of prosecco, be warned, this is not a good idea, it looks like a 3 year old has done it. Anyway, this year, we decided something simpler but a little more well done was in order, which leads me to the following cake. It’s nice and easy but it’s delicious and looks impressive once it’s decorated properly. 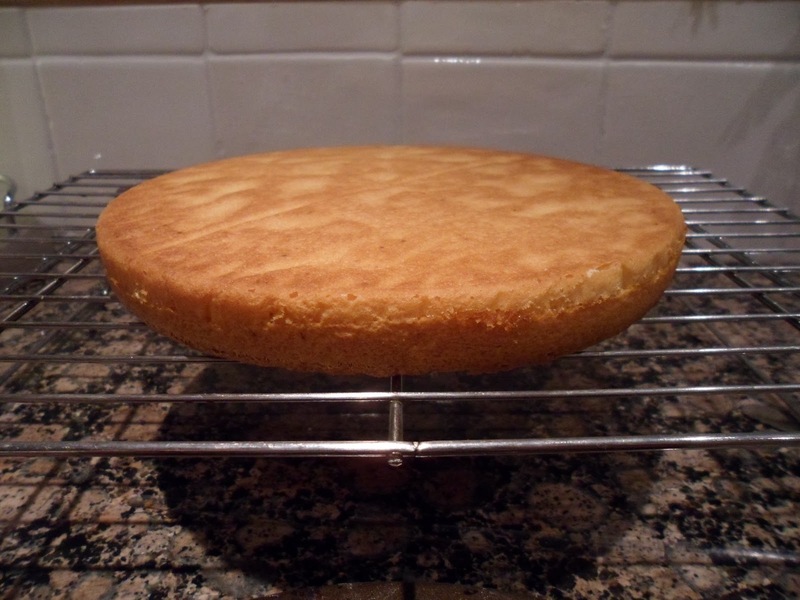 I didnt want to make huge one so this is technically a half recipe for the cake batter, if you want it bigger, or if you can’t be bothered to cut the sponge in half then just double it, if you do, i’d also make more ganache as you wont have enough to cover it with the amount i’ve reccomended here. As always, first things first, preheat that oven to 180F/350C. Then butter the cake tin, put a circle of parchment paper on the bottom, butter the parchment and dust with flour, shaking out any excess. For the sponge i would really reccomend you use either a stand mixer or at least a handheld electric whisk as this will take forever if you try and do it by hand. Put the eggs and sugar into the mixer and whisk until they are light and fluffy and doubled in volume- don’t panic, you can’t really overwhip them. Next, detach your bowl from the stand mixer and gently fold in your flour, making sure you really get it all out of the bottom, next up, fold in the melted butter, if you drizzle this round the edge of the bowl it’s easier to fold in, not sure why, it just is. if it doesn’t, well, never mind, you’ll be covering it up anyway. Cut the cake in half, horizontally and leave the two pieces on a rack. Next up, make the ganache, basically you just need equal parts double cream and dark chocolate. For this sized cake i used 100g of dark chocolate and 100ml of double cream, this did just about cover it but it was a bit of a stretch, to make things a lot easier, do 150g/150ml, you’ll thank me. 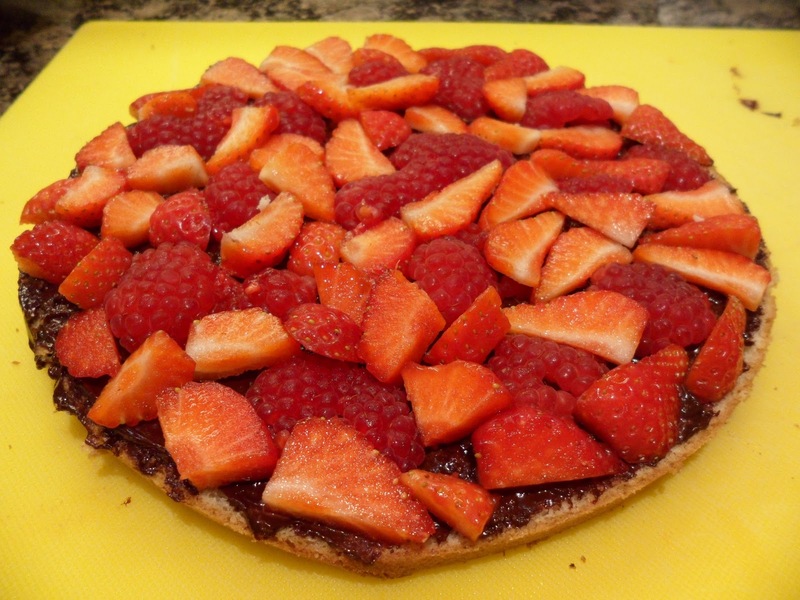 This also means that if you have any left over, you can dip some spare strawberries in it….. If you you want to do things properly, you melt the chocolate in a bain-marie (a bowl placed over a pan of simmering water, not touching). You bring the cream to the boil then take it off and let both the chocolate and the cream cool to 40C before combining in 3 stages. Feel free to do this, really do. However, i can’t be bothered with the frankly unneccessary washing up, so i do it this way. Break the chocolate into small pieces, bring the cream to the boil, pour the cream over the chocolate, stir. Doesn’t that seem like a better plan? I think so. Once you’ve made your ganache, leave it to cool until it’s spreading consistency. Meanwhile, prepare your fruit. The amount you use is totally up to you, as is what fruit you actually use. I like a mix of strawberries and raspberries as they’re really good with chocolate but you could really use anything. I think i probably went through about half a punnet of each, i cut the starwberries into chunks and the raspberries in half but they could be left whole just as easily. Top with the other half of the cake and cover the whole thing with ganache. It’s best if you do this in 2 layers, so do a thin one just to cover everything and then chill it in the fridge. Once the 1st layer has set, do the top layer more carefully, to smooth it out once you’ve covered it, warming your palette knife will help. Pop it back in the fridge to firm up again and then all you have to do is decorate it. I used some melted chocolate and some cream whipped with vanilla. After all that hard work, i think it’s probably best to cut yourself a big slice and enojy with a healthy dollop of whipped cream, don’t you?